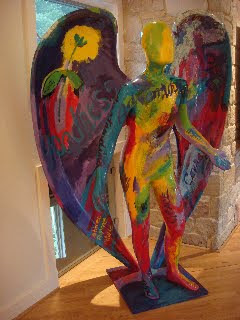 The below two sculptures were part of the Community of Angels Charity in Los Angeles in 2001. 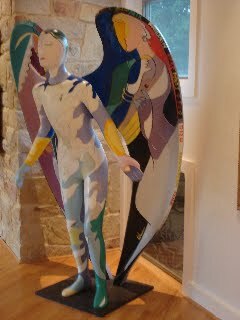 The two angels are Angel Virtue by Phoebe Beasley and Angel Peace by Ali Golkar. Because of some urgent issues, these two life sized sculptures are being offered by the owners to any one who wants them in an urgent plea to save them from being destroyed, as they need to be moved this weekend from their storage space... or destroyed. The two angel sculptures would make a great art statement not only to an ex-Angeleno, but to any lover of art. Please, help me find a home for these angels in someone's home or backyard or public art space! Whoever wants to acquire and save these two sculptures would have to pick them up this weekend. Email me for details! lenny at lennycampello dot com!! The most important business decision an artist makes is choosing the art festivals in which to participate. The process can be difficult, frustrating...and time consuming. And trying to compare many festivals can often be a confusing process, with subjective reviews and recommendations that may not relate to an artist's needs. That's where The Art Festival Directory with Show-Rate comes in. The Art Festival Directory includes detailed, complete information on more than 1,200 festivals nationwide--and growing daily. The information is provided by the festivals themselves--with up to 50 separate elements in each detailed listing. So local DMV area festival organizers should check this out and ensure their festival is listed. The Directory's search capabilities are robust: artists can use one or more top-line search criteria, retrieve summaries, then look at each festival's details. Artists can view their search results in listing, calendar and map formats...or all three! And, yes, it's all completely free! Each festival that chooses to be included in our exclusive evaluation system also carries in its listing a SHOW-RATE score, from 0 to 100, that tells artists how the festival compares with other festivals in 27 separate categories. A festival's SHOW-RATE score is calculated by comparing its characteristics with those voted by artists nationwide as their choices for what makes the perfect show. No individual show reviews are included, nor are sales for individual artists. SHOW-RATE has a single goal: to give artists an authoritative, comprehensive and easily understood tool to use in evaluating festivals for themselves. SHOW-RATE is free, too.